Kaminka, G.A., Fox, M., Bouquet, P., Hüllermeier, E., Dignum, V., Dignum, F., Van Harmelen, F.
Artificial Intelligence continues to be one of the most exciting and fast-developing fields of computer science. 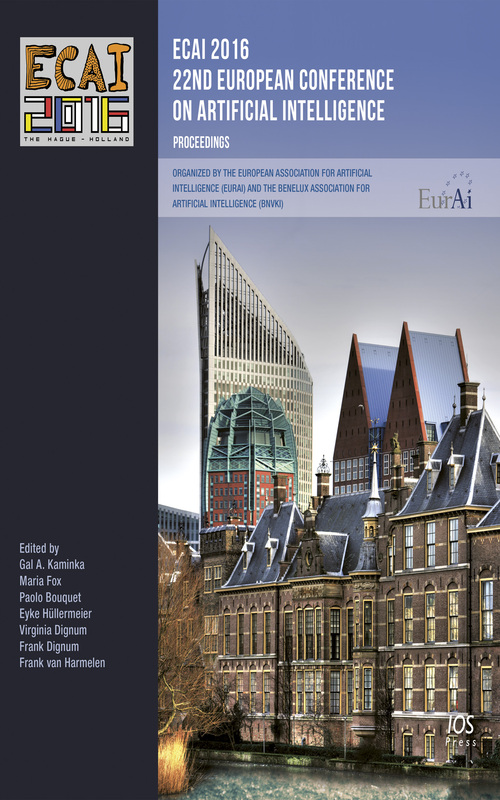 This book presents the 177 long papers and 123 short papers accepted for ECAI 2016, the latest edition of the biennial European Conference on Artificial Intelligence, Europe’s premier venue for presenting scientific results in AI. The conference was held in The Hague, the Netherlands, from August 29 to September 2, 2016. ECAI 2016 also incorporated the conference on Prestigious Applications of Intelligent Systems (PAIS) 2016, and the Starting AI Researcher Symposium (STAIRS). The papers from PAIS are included in this volume; the papers from STAIRS are published in a separate volume in the Frontiers in Artificial Intelligence and Applications (FAIA) series. Organized by the European Association for Artificial Intelligence (EurAI) and the Benelux Association for Artificial Intelligence (BNVKI), the ECAI conference provides an opportunity for researchers to present and hear about the very best research in contemporary AI. This proceedings will be of interest to all those seeking an overview of the very latest innovations and developments in this field.